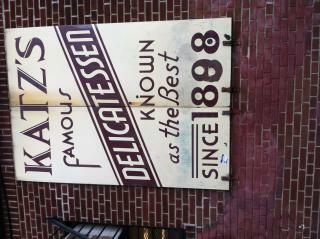 Katz's Delicatessen has been in business since 1888, in the same location. Famous for its deli meats, the historic restaurant also features creative decorations, both inside and out. Pictured here is one of the outer adornments. Inside, see such posters and advertisements as "Send a Salami to Your Boy in the Army!"